Trans-trax: Hasn´t Northolt shot its bolt? Hasn´t Northolt shot its bolt? Yet again we return to the question of more runway capacity at Heathrow. When the government coalition was formed a curt "no" was the only answer to the question of runway expansion at the London airports of Heathrow, Gatwick and Stansted. However, we are still waiting for the government policy paper on airport strategy which was originally due out in March 2012, but postponed to early summer and even now we do not have a publication date. This has led to all sorts of speculation, including a government U-turn on airport expansion. The Prime Minister, David Cameron, has insisted, though, that there will be no third runway (R3) at Heathrow. This in its turn has provoked all sorts of speculation and ideas have been floated (by whom??) about alternatives while keeping within the letter of the agreement keeping the lid on airport expansion. It appears that by using the assets already in place then a much needed increase in runway capacity can be achieved. This is where Northolt comes into the equation. At present it is an RAF base in the northwest of London. Rumours have been spread that the RAF is going to close it so it will become available for other uses. Unfortunately, despite delving into all sorts of files, websites, news sources and even the Ministry of Defence itself, absolutely nothing has been found about any possible closure of Northolt as an RAF base.That in itself should be enough to quash any rumours. However, we know very well that governments can change political positions from one week to the next, and even occasionally make quick radical decisions. 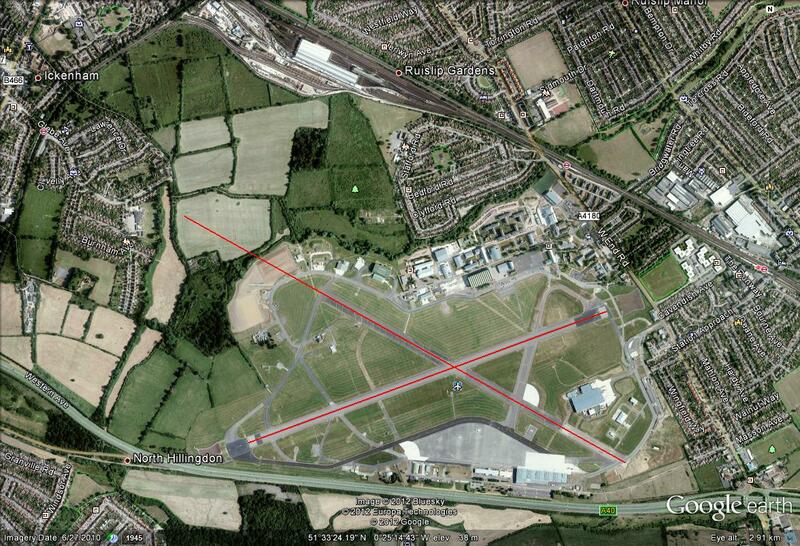 So let us work on the assumption that the closure of Northolt, as an RAF base, is possible. Particular Data: At present this base is used mostly for Royal, governmental and other VIP and Defence personnel transport with various HS125s and BAe 146s among other aircraft. It also houses RAF training and Air Cadet units as well as some Army and Royal Navy units. Recently it had based there some Typhoon fast jets taking part in exercises to protect the Olympic Games. At first glance then it seems that this base at Ruislip near Central London has very real uses for the RAF which they would be reluctant to give up. The two runways are aligned north west - south east (1.4 kms.long) and south west - north east (1.6 kms. long). This latter one cannot be extended to the SW as it runs into the A40 bordering the airfield, nor to the NE more than about 200 meters as it runs into housing and the National Rail and London Underground lines. This latter runway is 07/25. The other NW-SE runway is closed and not in use. It could, however, be reopened and extended to about 2.1 kms. across a green field. This is indicated in the photo of the map hereshown. This is a satellite view of the RAF base at Northolt, indicating the two runways with the SE-NW one extended. 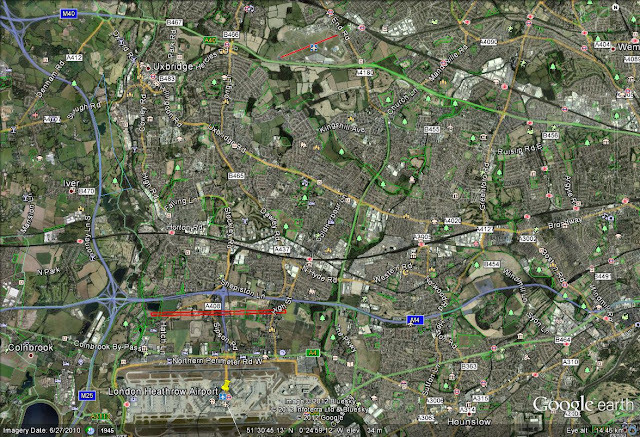 The distance between Heathrow and Northolt is 9.2kms. as the crow flies, so by road it is more but all depends on the route taken and to which terminal one is going. As you can see there is a problem with runway alignment. This is not so great a problem when the only aircraft flying into/out of the base are small jets and propeller driven aircraft. However, It is certainly a problem for air traffic control with any aircraft of a larger size - these need larger turning circles as well as longer runways. That means a conflict arises which is potentially dangerous. PublicTransport routes: There is just one bus route which passes the airfield (down West End Rd.) which is the E7 from Ruislip to Ealing Broadway. The next nearest, 114 Ruislip-Mill Hill Broadway, is on the other side of South Ruislip station (along Victoria Road).The nearest station is South Ruislip which is both LUL (Central line West Ruislip branch) and National Rail with Chiltern Railways (Marylebone - High Wycombe) services.None of these goes near Heathrow and so involve at least one change to get there. Roads: Probably the simplest way to communicate to Heathrow would be to take the A40, which directly bypasses Northolt airfield, westwards to where the M40 begins and then turn south on to the M25 (slots permitting!!). T5 is easily accessible, T4 is relatively easily accessible from the M25, while the central area terminals 2 and 3 need a more roundabout route. To gain easy access to the central area from Northolt it would probably mean taking the A4180 then the A312 southwards to the M4 or later the A4 (Bath Road) turning westwards in either case to join the Tunnel Entrance Road to the Heathrow Central Area. All these options of course mean extra traffic on already excessively crowded roads (hence the slots comment). It means cars, taxis and connecting buses all of which are noisy, polluting and congestion causing. Far from being an attractive option. It has been suggested that a fast tube link be constructed between Northolt and Heathrow. If it were a tube then presumably it would go underground so as not to disturb the housing (and their residents) in the area. This a very expensive option just to connect a minor airport with small aircraft using it to the main hub airport. Would it be cost effective? On the other hand, if the connection were overground then you would have to choose a route and subsequently decide which housing and businesses would be affected. Also very costly but both economically and politically. What has not been mentioned are the start and finishing points of such a connection, and even how many stops it should have. 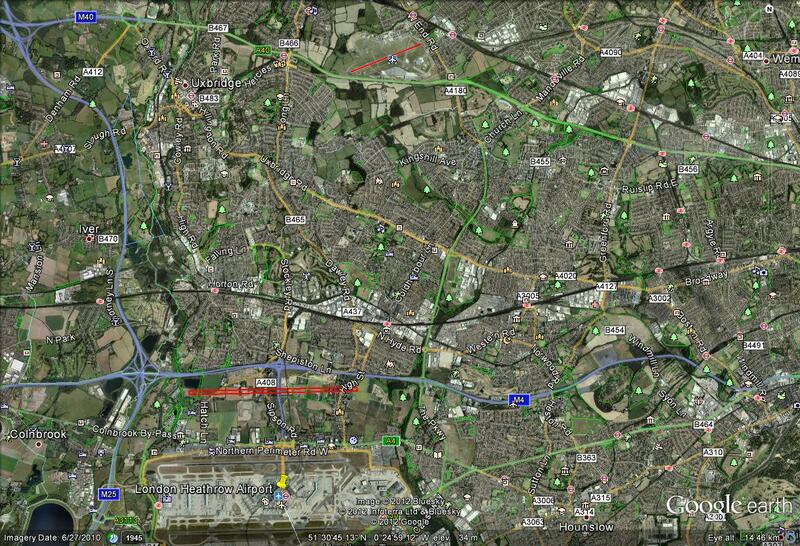 Would it start at Northolt terminal or further north - e.g. South Ruislip station to link with the LUL and Chiltern Lines - or even elsewhere? Where would the line end - via T5 and on to Staines, or via T4 and on to Feltham? In either case one terminal would lose out thus reducing the benefit of the connection. Autonomy: Northolt cannot be looked at as anything other than another minor airport in London. Its operation would, by necessity, be independent from Heathrow. To provide all the auxiliary services that aircraft and passengers need you would have to duplicate them at Northolt - a ridiculous expense. Cleaning, minor maintenance, fueling, food and drink, trolley extras (duty free goods etc. ), baggage handling and so on all mean added expense. If they were provided by Heathrow then how much would the roads get clogged up by the extra traffic? For aircraft to be maintained they would have to fly into Heathrow eating up precious slots. It is unimaginable how much the resulting chaos would be, especially in adverse weather conditions. Who would fly there? : No airline would go to Northolt voluntarily. Even if the government decided to force airlines (and this means BA and Aer Lingus) that fly the British Isles routes then it would be most detrimental to those airlines. If other European airlines were involved then the government would have a diplomatic incident on its hands. Whether one or the other you cannot discriminate in such cases - the resulting case in the European Court brought against the government by the airlines would be won easily by them and would need a total climbdown by the government, meaning the death knell of Northolt as an airport. This point in itself destroys the case for Northolt. Runway Three: A third runway (R3) at Heathrow between the M4 and the A4(Bath Road), where originally proposed, would suffer none of the problems encountered by Northolt. 1-It would be built parallel to the present runways, and used in "mixed-mode" so would not cause problems to air traffic control. 2-It could be built as a full length runway to be available IN EMERGENCY/EXCEPTIONAL CASES ONLY while its normal use would be for small and medium jets together with propeller driven aircraft. 3-A new terminal 6 (T6) would be built to serve R3 but the operation would be so designed that airlines/aircraft would always (or at worst almost always) fly into/out of R3 and T6. That way there would be no need at all for planes to cross the other runways, except in exceptional circumstances. 4-Some housing would have to be demolished but a lot of the housing, hotels, car parks and sundries could be maintained. 5-Taxiways(3 or at most 4) would need to be built to connect to the main airfield and the northern runway. 6-Road works would be needed for the A4 to pass under the taxiways and there might be some other minor works. 7-No tube or rail lines need be built as the existing Heathrow Express/Crossrail line already passes under or near where T6 will be constructed meaning only a new station would be necessary. 8-All auxiliary/maintenance services are on site or on hand. 9-The links to the other terminals would exist from T6 with the opening of the new HE/Crossrail station. 10-Therefore, the case for airlines to object for a transfer of some routes to T6 would not exist. 11-No (or at worst very little) extra road traffic would be needed - quite the opposite of the case at Northolt where the increase would be substantial. 12-The progressive limitations on noise and engine pollution would be as stated on previous blogs and extended to other airports eventually. Northolt is not an option to serve Heathrow at all. R3 and T6 are the best options to relieve some of the congestion at Heathrow. The real solution is to use the assets this country has and let the other airports expand. You cannot deny necessary infrastructure today with arguments when you can insist on their solution for tomorrow. A 2 or 3 hub solution certainly has merits. Does not the Greater New York area work with LaGuardia, Newark and JFK as major airports? The mega hub airport idea is just a fad. So many passengers complain at the sizes of Paris CDG and Frankfurt. Let us not try to go down the same road. We have to build on our advantages and not follow everybody else like sheep. We have five airports (and that is only serving the London area) and must capitalise on those assets. It is so easy to spend other people´s money on big white elephants - no thank you. "Heathrow´s 3rd runway - how to focus"
endorsed by industry experts....under 10 years to deliver sustainable aviation expansion in the SouthEast. The Airtrack Lite fantastic, tripped up?